Step three is adding color areas and adding detail to faces and hands. There's a few weird color bits happening still, but I'm planning on fixing that. This entry was posted on Friday, July 17th, 2009 at 2:49 pm	and is filed under illustration. You can follow any responses to this entry through the RSS 2.0 feed. You can leave a response, or trackback from your own site. someone was actually wearing a tie at a poker game? that just seems wrong. Yeah, but I made up for it by not wearing any pants. 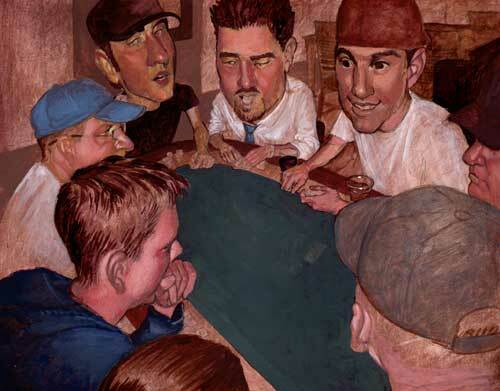 if you play poker without pants so you gotta be reaaaaaally careful about raising.